DSHG-7X Handheld XRF Soil Analyzer can do site analysis for various conditions. The function includes site analysis for in situ soil to investigate local environment and apply in soil and water conservation project.The operator can analyze local soil directly or make analysis through sampling first. By site acquisition process and soil sample analysis, you can get the same effect as that in the laboratory. 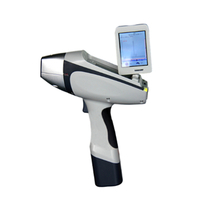 DSHG-7X Handheld XRF Soil Analyzer also can be used to detect filter material, painting material, wood processed by chromated copper arsenate and other various test samples. 1.Fast survey and measurement of polluted metal composition,mode and boundary. 2.Field monitor metal referred in RCRA and priority controlled polluted metal. and also provide theory basis for deep analysis of pollution control and redress method. acquisition and analysis thousands samples fast and exactly is an essential basic ability. then you can detect RCRA metal,main pollutant and goods required to be detected easily. decision in time, while the test cost is much lower than laboratory analysis. existing density and chemical form of heavy metal in environment,food and living body. It mainly displays in water pollution,some others are in atmosphere and solid waste. metals like Pd,Hg,Cd,Co enter into atmosphere,water and soil to lead serious pollution. boosts largely,also the absorbed amount increases 100 times more than primitive man.